Dispersin B is a β-hexosaminidase that specifically hydrolyzes β-1,6-glycosidic linkages of acetylglucosamine polymers found in biofilm. This enzyme is derived from Aggregatibacter actinomycetemcomitans, which secretes adherent cells from mature biofilm colonies by secreting disperse B. 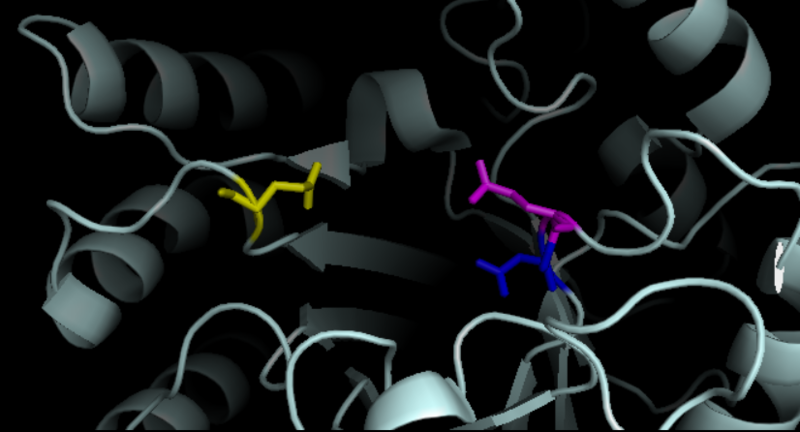 The active site of Disperse B contains three highly conserved acidic residues: aspartic acid at residue 183 (D183), glutamic acid at residue 184 (E184), and glutamic acid at residue 332 (E332). Blue color shows the E184；Pink color shows the D183；Yellow color shows the E332. 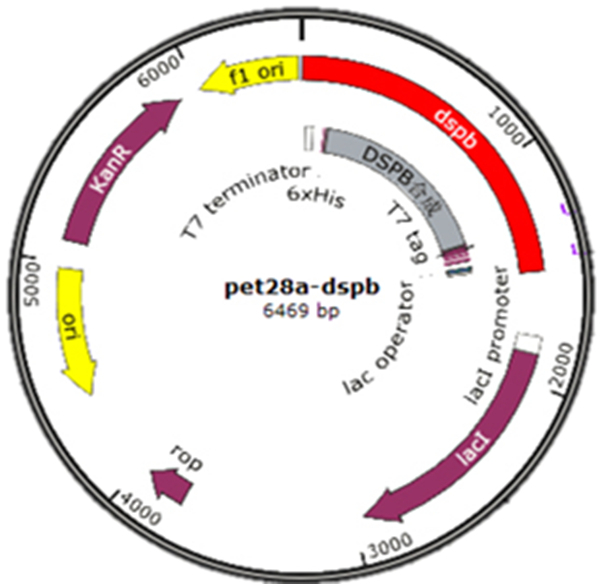 We hope that DspB, like siderophore, is regulated by AHL, and when AHL is present, the dspb gene will express. 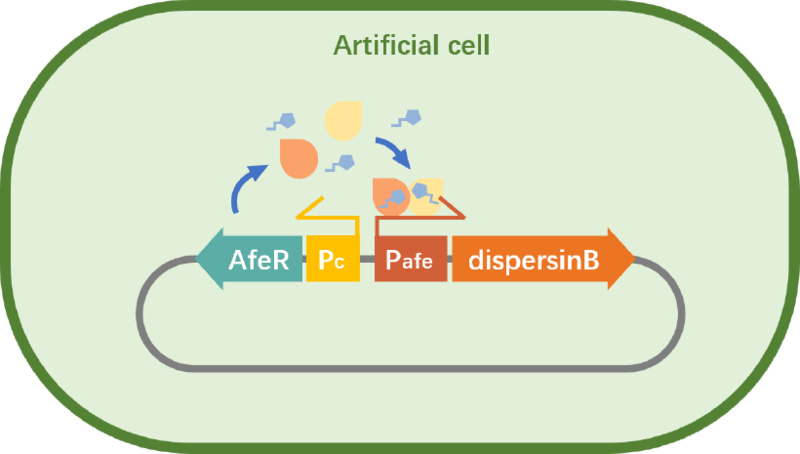 Given that the DspB enzyme activity is low, we planed to make it accumulate in cells first, and then be released by the subsequent lysis system. In order to test the biofilm removal effect of DspB, we constructed the vector pET28a-dspB. The expression of DspB was verified by SDS-PAGE(Figure 3). 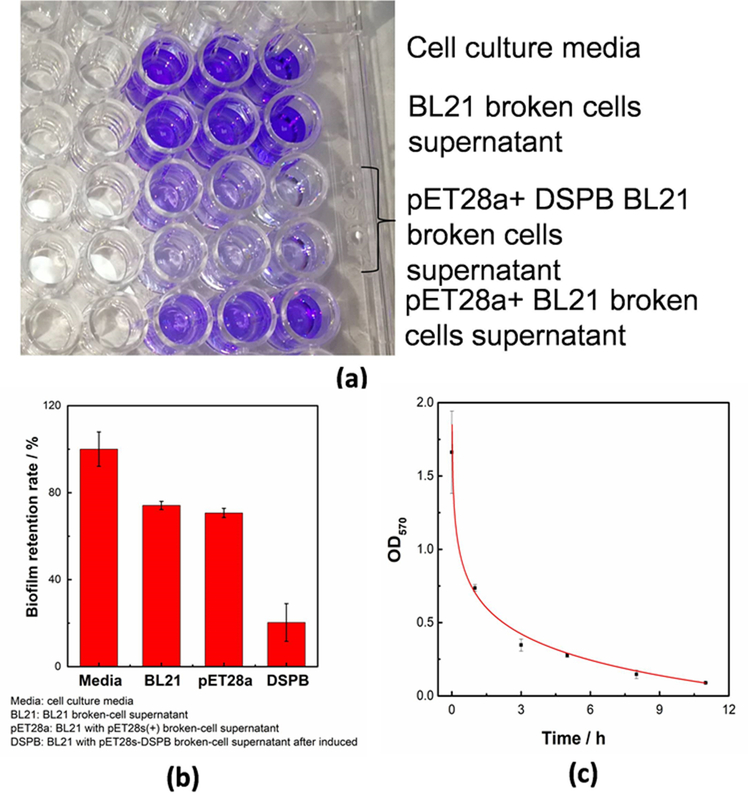 The cell culture medium was blank control, and the pre-induction cell supernatant was used as a negative control. In the figure 3 we can see that there are bands at about 37 kDa, these band of experimental groups are thicker than the negative control. And our target protein is about 40kDa. We think the protein here may be DspB. Then, we tested whether the engineered bacteria expressed active DspB through enzyme activity experiments. 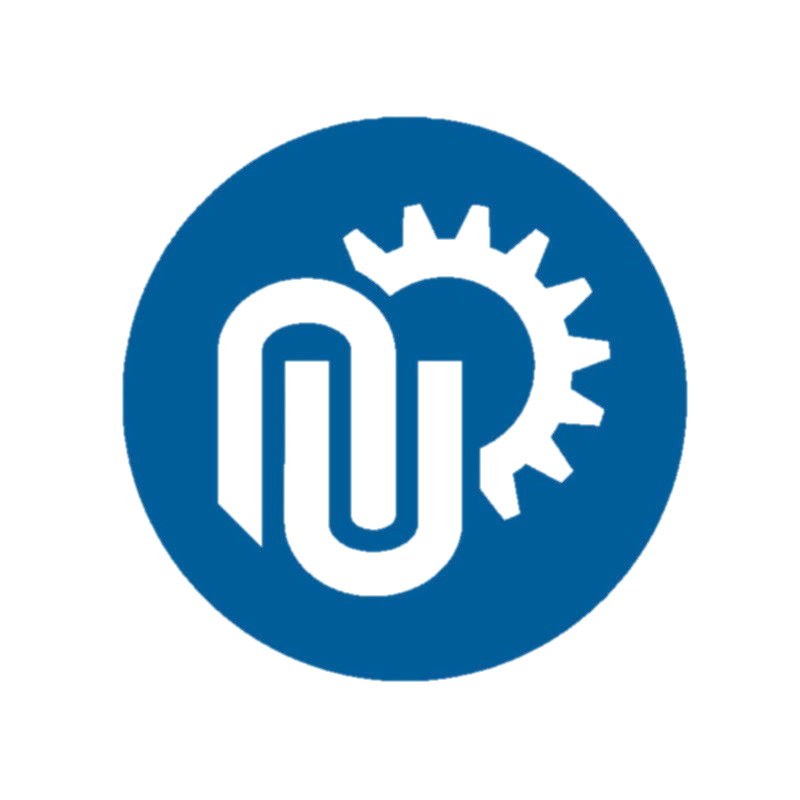 4-nitrophenyl-N-acetyl -β-D-glucosaminide(NP-GlcNAc) is hydrolysed by DspB and become 4-nitrophenol with the maximum light absorption at 405 nm. 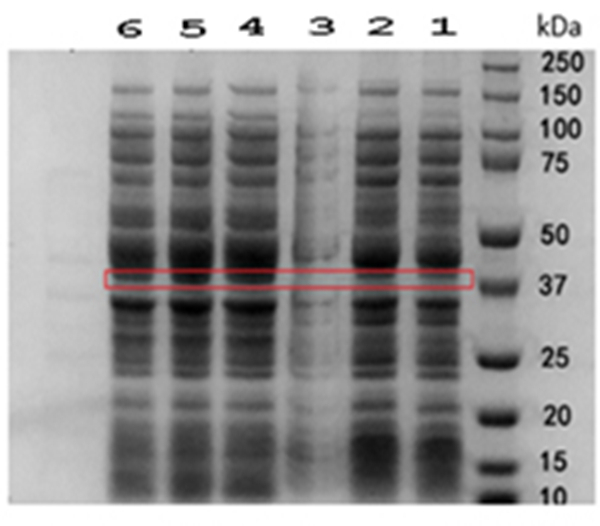 20 mLbacteria solution is disrupted and acted supernatant as DspB enzyme solution. We washed and shred the bacterial solution after induction, and took the supernatant as the enzyme reaction solution of DspB while NP-GlcNAc working as a substrate.The enzyme activity experiment was carried out by using 100 μL of enzyme reaction solution and 100 μL of substrate solution (substrate concentration is 5 mM). The enzyme activity of the supernatant calculated by the enzyme activity calculation formulais (Activity/(U/mL)=(kOD405-kseldecomposition)*18231.26 *dilution ratio) is 66.363U/mL. The experiment proved that the recombinant bacteria expressed active DspB, and we used the E. coli supernatant with DspB activity to carry out the biofilm removal experiment.DH5a was cultured overnight in LB at 37 ° C and 220 rpm, and transferred to a 96-well plate at 37 ° C and cultured for 48 h, then discarded the supernatant .The biofilm was washed with PBS, and 200 uL of the reaction solution was added to react for the whole night. Add crystal violet to stain, wash the solution into the new well plate after alcohol washing, and measure the absorbance at 570 nm. The smaller the absorbance value, the better the membrane removal effect. 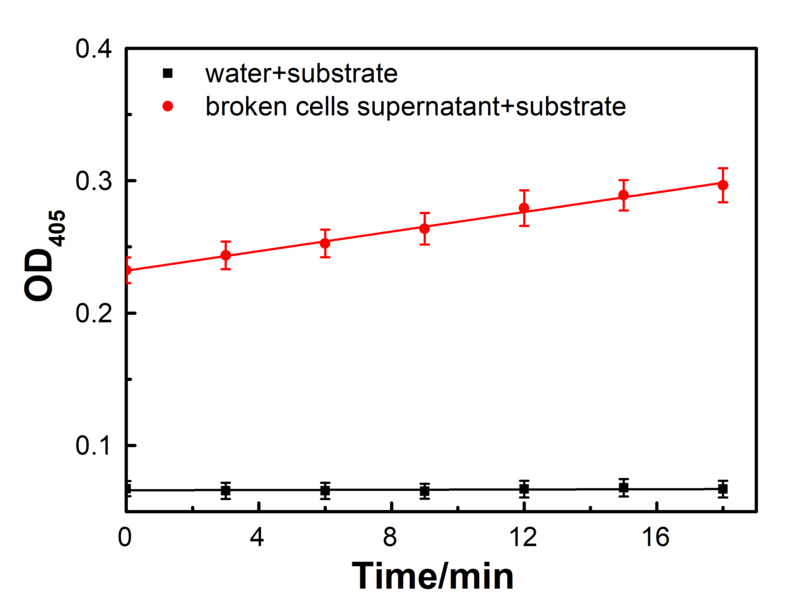 From Fig.5, The supernatant of the recombinant E. coli has the highest biofilm removal rate, and the biofilm removal effect is getting better with time.